A question was posed by one of our readers regarding what kind of paper to use in bookbinding, thus inspiring this posting! I have been experimenting with different "innards" for my journals, most recently working on a journal for myself with a mix of sketch paper and watercolor paper. What type of paper you use to fill your journal depends on the intended use. For my journal, I wanted something I could sketch and draw in, but also use watercolor paints so I alternated the papers. If you're making a journal to sell, think about your target market, considering the price your buyer would be willing to pay. That may determine what type of paper you use. For example, if your target sales price is $10, it wouldn't make sense to purchase a ready made text block or use high quality watercolor paper exclusively. Likewise, if you're making a high quality journal, a buyer would expect a nice weight of paper inside. You can make your own text block or purchase a ready made one from a supplier, a few of which are listed here. 90 lb works good for covering the book board as it isn't quite as bulky on the corners. Inside you can include a range of weights, 90 lb and up, or one weight exclusively. I wouldn't recommend anything lower than 60 lb. 50 lb or less tends to be too thin, and also tears easily when sewing. Is a loose term for anything ranging from copy paper, writing paper, or lightweight sketch paper. This is by no means an all inclusive article on text blocks and as always, I welcome your comments. Thanks for your informative responses on our previous postings and I look forward to learning more on this subject from you! I'm very curious now - do you really make your covers first, before you make the book block?! Actually, yes! The covers are the fun part for me. Apparently not everyone does that?! Well, as i see it, the book block is the most important part of any book and the cover exists to protect it. So I always prepare the book block first, then design a cover to protect it! I agree with rhonda,that the text block is made and the case is then made to suit. On which text papers to use always make sure the grain of the stock used, runs head to tail. Having the grain direction right, prevents wrinkling & creasing problems. 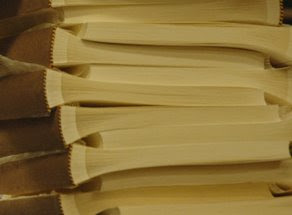 In fact, where possible, all materials used in binding a book,the grain should run head to tail as this will make your final product stronger and it will look better. Well I guess I must make my books backwards from everyone else! But the end result--a well made book--is the important thing. Mine are mostly coptic stitch, and I could see where a case bound book would require assembly the other way around. Yes, i think you're right uberart, it would be much easier to make the covers first for a coptic bound book! Got a little sidetracked here in our comments! Good info about the paper, uberart, very useful! I make the text block first too, but if I'm really excited about doing the cover, I'll sometimes do it first. :) I usually use sketch paper or computer paper. I always want to experiment though and I want to try new papers like watercolor, etc. I made one journal with a variety of art paper once - paper that's supposed to be used for charcoal, etc. I'm also a cover first coptic binder- making the cover first tends to get me over the hump of preparing the signatures and excited about the book. For innards I've found that a 70lb. text weight paper works very well for text blocks- the price per sheet (when bought in a ream) is very reasonable and the weight holds up well to ink. I usually get something acid free with a high recycled content from The Paper Mill Store (online). This is a late comment to this article so I hope someone will see it and possibly be able to answer. I'm new to book making and soaking up all information available at the moment. I was curious as to how your buy your paper. Do you buy big sheets and then cut/tear them to size or do you buy paper already cut to a reasonable size and just tear the edges off? So far I've been using 100% recycled printer paper but want to make a nicer book block for a change. I've been experimenting making my own paper but I'm not very good at that yet.